Clarence Darrow questioned William Jennings Bryan on the 7th—next to last—day of the Scopes Monkey Trial, producing some of the most hilarious banter ever to grace a courtroom. The banter began before Bryan ever got on the stand. After agreeing to get on the stand, Bryan asked whether, in return, he could call Mr. Darrow, Mr. Malone, and Mr. Hays, the three defense lawyers. After the judge replied, "Call anybody you desire. Ask them any questions you wish," William Jennings Bryan excitedly said, "Then, we will call all three of them!" Clarence Darrow retorted, "Not at once?" Interestingly enough, Darrow did not require William Jennings Bryan to be sworn in, even though Bryan offered. "I take it you will tell the truth," he told him. There's a couple interesting parts to this line of questioning. First, Clarence Darrow kept accidentally saying that Jonah swallowed the whale. He only corrected himself the first time. Bryan: My impression is that it says fish; but it does not make so much difference; I merely called your attention to where it says fish—it does not say whale. Darrow: But in the New Testament it says whale, doesn't it? Bryan: That may be true; I cannot remember in my own mind what I read about it. Darrow: You don't know whether it was ordinary run of fish, or made for that purpose? Bryan: You may guess; you evolutionists guess. Darrow: But when we do guess, we have a sense to guess right. Bryan: But do not do it often. I keep referring to this trial as a circus side-show. This sort of thing is the reason why. Exactly what does this have to do with whether John Scopes taught evolution contrary to Tennessee law? Judge Raulston said that was all they were there to determine. That was Clarence Darrow's second time to get Jonah and the whale backwards. William Jennings Bryan doesn't catch it. Bryan: If the Bible said so; the Bible doesn't make as extreme statements as evolutionists do. Clarence Darrow made an inoculous reply here. Bryan: The only thing is, you have a definition of fact that includes imagination. Darrow: And you have a definition that excludes everything but imagination. At that point, they had gone to far even for the Scopes Monkey Trial. Attorney general Arthur Stewart objected to Clarence Darrow's statement as argumentative. 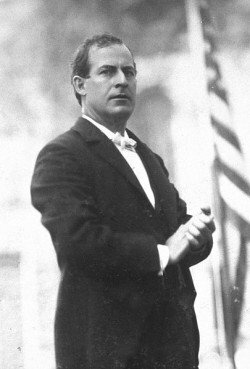 As he did so, William Jennings Bryan tried to get a retort in, but Darrow cut him off with, "The witness must not argue with me, either!" They then went back to questioning without the judge commenting on Stewart's objection. Clarence Darrow then brought up the sun standing still in the book of Joshua. He tried to get William Jennings Bryan to either say the sun goes around the earth or at least admit that the writer of the book of Joshua believed the sun went around the earth. Bryan would no neither, and Attorney General Stewart objected that the whole line of questioning was an irrelevant waste of time. It seems to me it would be too exacting to confine the defense to the facts; if they are not allowed to get away from the facts, what have they to deal with? Apparently that satisfied the judge, and he ordered questioning to continue. Bryan: I believe [the book of Joshua] was inspired by the Almighty, and He may have used language that could be understood at that time. Bryan: Instead of using language that could not be understood until Darrow was born. 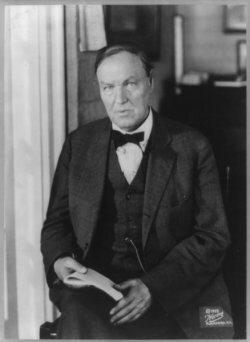 Clarence Darrow devoted many questios to whether the earth had to stand still for the day to lengthen in the book of Joshua. Mostly, William Jennings Bryan refused to comment on that, though at one point he did admit that must be so. Finally, Darrow gave up and moved to the age of the earth. On that matter, too, Bryan refused to take a firm stand. He acknowledged he knew the estimate of Bishop Usher, that the earth was created in 4004 B.C., but his comment was, "That has been the estimate of a man that is accepted today. I would not say it is accurate." Clarence Darrow was apparently ready to answer that strange statement. Darrow: Do you think about things that you do think about? Bryan's answer of "sometimes" brought laughter from the courtroom. The attorney general was apparently getting frustrated, but his objection was answered by the judge in the same way. "I am going to let Mr. Bryan control." Bryan: I want him to have all the latitude he wants. For I am going to have some latitude when he gets through. Darrow: You can have latitude and longitude. At that point both Attorney General Stewart and Gordon McKenzie, the solicitor attorney general, objected. They argued that no evidence that pertains to the case was being obtained. These gentlemen ... did not come here to try this case. They came here to try revealed religion. I am here to defend it, and they can ask me any question they please. Again, Judge Raulston let the exchange go on. Bryan: From those whom you called "yokels." Judge: I will not stand for that. Judge: I am talking to both of you. The attorney general objected once again, and once again the Judge said he would let it continue because Mr. Bryan was looking forward to his own questions. At that point, William Jennings Bryan pointed out that the jury was not there for this questioning, so Attorney General Stewart let things continue. After Clarence Darrow spent a long time trying to get William Jennings Bryan to discuss the fact that Chinese and Egyptian history goes back further than the Biblical time of the flood, Attorney General Stewart couldn't bear it. One of the issues involved is that Darrow had called Bryan to the stand. Thus, Bryan was by legal definition not a hostile witness. He was a defense witness, called by the defense, despite the fact that he was on the prosecution's team. Clarence Darrow, however, in answering Stewart's objection refers to his "right to cross-examine a hostile witness." To this Stewart explains that William Jennings Bryan is not a hostile witness. He also explains that if Darrow's own witness turns out to be hostile, then Tennessee law gives procedures for cross-examining him, which include filing an affadavit that Darrow has been surprised by the witness' attitude. Is there any way by which a witness can make an affidavit? That the attorney is also hostile? Darrow: I am not hostile to you. I am hostile to your views. In an attempt to get Bryan to look at the age of certain civilizations, Clarence Darrow asked Bryan about other religions. While Bryan avoided most of those questions, saying he'd never studied them, he got excited when Buddhism and Confucianism were mentioned. Bryan: I can tell you something about [the religion of Confucious or Buddha] if you would like to know. Bryan: Would you like me to tell you what I know about it? Bryan: But I think when the gentleman asked me about Confucius I ought to be allowed to answer his question. Darrow: Oh, tell it, Mr. Bryan, I won't object to it. In case you're curious, Bryan wanted to tell everyone that Confucious' religion was based on reciprocity. William Jennings Bryan thought this very inferior because Jesus Christ calls us to serve people based on need, not on whether they will serve us in return. Darrow: Do you know how old the Confucian religion is? Bryan: Not to be able to speak definitely as to date, but I can tell you something I read, and will tell you. Darrow: Wouldn't you just as soon answer my questions? And get along? Clarence Darrow and William Jennings Bryan got their ires up again when the subject of population at various eras of time came up. Bryan: You are the first man I ever heard of who has been interested in it. Darrow: Mr. Bryan, am I the first man you ever heard of who has been interested in the age of human societies and primitive man? Bryan: You are the first man I ever heard speak of the number of people at those different periods. Darrow: Where have you lived all your life? Darrow: Nor near anybody of learning? Bryan: Oh, don't assume you know it all. Now will you let me finish the question? Nothing in the transcript preceding gives any indication there's a background to this request by William Jennings Bryan. It catches Clarence Darrow by surprise. Darrow: What question is that? If there is anything more you want to say about Confucious I don't object. This statement by Clarence Darrow is almost sarcastic. Confucious has not come up in a couple pages of testimony, but Bryan made such a scene about it that Darrow is referring back to it. Amazingly, though, that is exactly what William Jennings Bryan is referring to! Bryan: Oh, yes, I have got two more things. Darrow: If Your Honor please I don't object, but his speeches are not germane to my question. Judge: You went into it and I will let him explain. Darrow: I asked him certain specific questions about Confucious. At that point, Bryan points out that Jesus' positive "Do unto others" is better than Confucious' negative "Don't do to others what you don't want them to do to you." Bryan concludes his short speech with, "Now, Mr. Darrow, you asked me if I knew anything about Buddha?" I'm pretty sure Mr. Darrow is incredulous at this point. Bryan: No, sir; I want to answer your question on Buddha. Darrow: I asked you if you knew anything about him? Darrow: Well, wait a minute, you answered the questions. Judge (tormenting Darrow purposely? ): I will let him tell what he knows. Darrow (horrified): All he knows? Judge: Well, I don't know about that. Bryan: I won't insist in telling all I know. I will tell more than Mr. Darrow wants told. At this point I was ready to kick my feet in the air laughing. This is a courtroom? Darrow: Well, all right, tell it. I don't care. As if the lead-in to this exchange wasn't childish enough, the beginning of what William Jennings Bryan wanted to say is somewhat ridiculous. Bryan: Buddism [sic] is an agnostic religion. Darrow: To what?—what do you mean by agnostic? Darrow: You don't know what you mean? Darrow: Do you remember his name? Bryan: No, sir, I don't. Darrow: What did he look like, how tall was he? Bryan: I think he was about as tall as you but not so crooked. I think we will leave the examination at that insult. After many more questions and comments in a similar vein, court adjourned till morning. Judge Raulston ordered the entire questioning of William Jennings Bryan expunged from the record the following morning and decided not to allow Bryan to question the defense team. At that point, the defense team asked for and received a guilty verdict so that they could bring the Tennessee anti-evolution law to appeal. If you have not read the story of the Scopes Monkey Trial, you should do so. It is very interesting. If you are at this site to find evidence for or against evolution, you will find links to follow at both the evidence for evolution and evidence for creation pages. Thank you for coming to Proof-of-Evolution.com!